SAUK VILLAGE | Village Trustee Derrick Burgess announced he is running for Mayor in the April, 2017 election Saturday afternoon at the Sauk Village Café surrounded by a crowd of supporters. Burgess kicked off his campaign for mayor saying that the Village needs a Pathway to Progress and he will be the leader who will begin that new direction. Burgess pledged to bring his campaign to the people of Sauk Village to share his vision and his plans for where he wants to take Sauk Village. Burgess said that the Village must invest in the children and give homeowners a reason to buy and invest in Sauk Village once more. Burgess will lay out his plans, which will include new policies and actions that will increase openness and transparency within all aspects of Village government. “The time for talking about change is over. We need a leader who will pursue an ambitious Pathway to Progress from day one” Burgess said. “I am running for mayor to bring community and collective vision into the Mayor’s office. To truly put us on a Pathway to Progress. 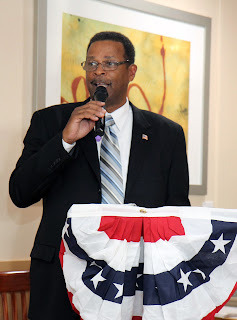 As Mayor, I will govern with service, integrity, courage, openness, honesty and transparency because Sauk Village needs a strong and true leader” Burgess said. Village Trustee Cecial Tates, who introduced Burgess as “the next mayor of Sauk Village” was named as his campaign manager. Burgess praised Tates who served his country as a Lieutenant Colonel in the United States Army and who has served his Village as former School Board President and now as Village Trustee. Burgess, who was attending the Illinois Municipal League Annual Conference in Chicago, took time out and returned to Sauk Village to make his announcement and then returned to Chicago immediately following his announcement. “It’s been a very busy week. I’ve met with many mayors and officials from throughout the region and state. We have been discussing many of our common problems and discussing solutions” Burgess said. Burgess said he already has more than enough signatures required to get his name on the April, 2017 ballot . Burgess said he decided to run because so many residents have been asking him to run. “I have been listening to the residents of the Village. They are looking for and have been wanting the Village to move in a new direction. Many long-time residents have asked me to run so how could I say no” Burgess said. Village residents will be electing a new mayor since one-term mayor David Hanks announced Tuesday that he will not be seeking re-election. Burgess, Tates and Trustee Kelvin Jones swept all three seats in the 2015 election easily dispatching all three candidates supported by Hank, a huge change in the political paradigm. Burgess was the top vote getter in his re-election bid.